For centuries, Georgia's ability to ward off invaders has been ascribed to its culture of encouraging the martial arts, or Khridoli as they are known. Thanks to this Georgia has endured while other historic nations, both small and large, have vanished without trace. For over 3,500 years Georgian warriors have withstood enemies attacking the various kingdoms of Georgia. They also united the Georgian kingdom. Along with their domestic military successes Georgian mercenaries and commanders were prominent in many other countries; for example, the Mamelukes in Egypt, the Kulemens in Iraq, and the Kulis in Iran all had a complement of Georgian troops. Similar success was found at times in Afghanistan, India, Turkey and Russia. Due to the constant threat of military action Georgian warriors were always on high alert. Until the beginning of the 20th century every region of Georgia held competitions in martial arts and other sports similar to the ancient Olympic Games. Some were conducted like military maneouvres, in which several thousand men fought by the rules of Saldasti (a special boxing style with the added use of swords and other combat weapons made of wood). The diversity and multiplicity of features of the fighting styles practised in various regions of Georgia had a crucial influence on the formation of Georgian martial arts and their rich culture. Each part of Georgia had unique military traditions. More than 30 styles of wrestling and boxing have been practiced in Georgia, as well as a wide range of armament and combat forms. Georgia also had a “Warrior Code” consisting of 365 rules. Due to the need for constant military vigil, these rules were in effect throughout Georgia and contributed to the code of conduct and way of life which developed for all Georgians. Unfortunately in the 19th century the traditions of Georgian martial arts were under serious threat of extinction. The occupying Russian Empire repressed all aspects of the Georgian cultural heritage, and especially military traditions. Moreover, after the second Russian occupation in 1921, Georgian martial arts and the whole Georgian State submitted to the control of the Russian Bolsheviks. Georgian wrestling and boxing were major contributing factors for the creation of Russian Sambo, but for 70 years, the practice of Georgian martial arts was strictly banned. The Khridoli rules of fighting originated thousands of years ago and have developed since; for example moves that endanger the opponents life, such as arm breaking, doesn't exist in modern Khridoli. In the past masters of Khridoli had to know wrestling, boxing and fencing as well. 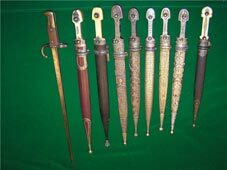 Georgian weapons also played a great role in the survival of Georgia because Georgians have one of the oldest smithery traditions. Equipped with the best weapons, Georgian warriors were more difficult to defeat. Some details about Georgian smithery are mentioned in the Bible. The Ancient Greeks also considered Georgians to be the inventors of steel. Modern academics have different opinions on this, though all consider the Middle East the cradle of metallurgy and tribes related to the Georgians, such as Chaldees, Tubalis and Mosiniks the first producers of base metals in the world. Most scholars also acknowledge the influence of the metallurgy of the Caucasus and Asia on Sumeria, Egypt, Cyprus, Greece, Rome and Western Europe. In European and many other eastern languages the names of various metals are derived from the names of Georgian tribes, which proves that Georgians were very aware of metallurgy. Knowing the secrets of steel making, they produced better weapons. The Russian Empire noticed Georgian's abilities in this field. They acquired some of their secrets and through the Gruzinski Bulat began to produce new Russian weapons. But it turned out that the Georgian steel masters did not give away all their secrets and the new Russian weapons could not maintain the quality and features of Georgian swords.